Sicilian Orange Cake. Doesn't that sound good? 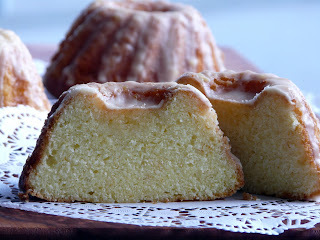 I found a picture of this cake along with the recipe on another blog - The Little Teochew. Her blog is full of wonderful recipes and photos. 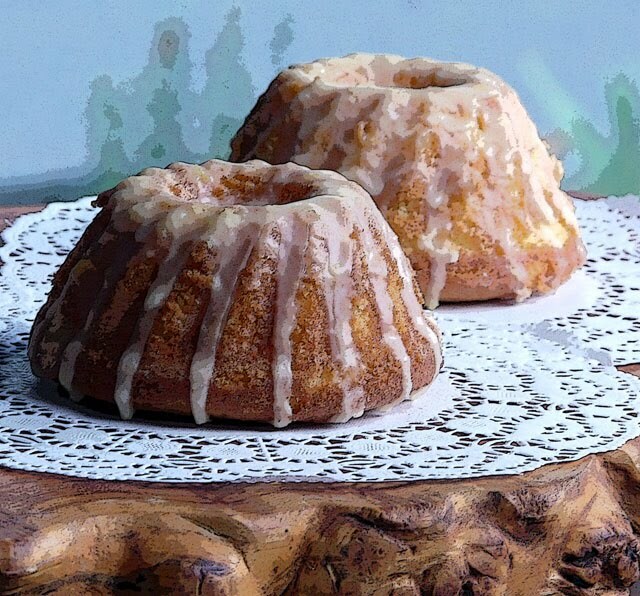 Rather than one big cake I made 6 small bundt cakes. They came out of the oven just before I had to leave for work. I had just enough time to drizzle on the glaze before walking out the door. Moe had one of the cakes while it was still warm but I had to wait until I got home for a taste. Very similar to a pound cake. Lovely texture and fresh orange flavour. The only change I made to the recipe was to add vanilla. It is almost impossible for me to bake without adding vanilla. And vanilla and orange do compliment each other. 1. Preheat the oven to 170C. Grease and line a 22-cm clip-sided round cake with non-stick baking paper. 2. Using an electric whisk, cream the butter and sugar together for 4-5 minutes until very pale. Beat in the eggs, one at a time, beating very well between each one, if necessary adding a spoonful of flour with the last egg to prevent the mixture from curdling. Beat in the orange zest. Add the flour all at once and mix in well, then slowly mix in the orange juice. Add vanilla if using. 3.Spoon the mixture into the prepared tin and bake on the middle shelf of the oven for 45-50 minutes or until a skewer, inserted into the centre of the cake, comes out clean. If it starts to brown too quickly, cover loosely with a sheet of lightly buttered foil. 4. Leave the cake, in its tin, to cool on a wire rack, then carefully remove the sides and base of the tin and peel off the paper. Put it onto a serving plate. 5. For the icing, sift the icing sugar into a bowl and stir in the orange juice until you have a spreadable consistency. Spread it over the top of the cake, letting it drip down the sides, and leave to set. Serve cut into slices, and store any leftovers in an airtight container. Ann, those are so pretty! I made an orange cake today, too, and now I wish I would have made them in the little bundlette pan! Great photos! 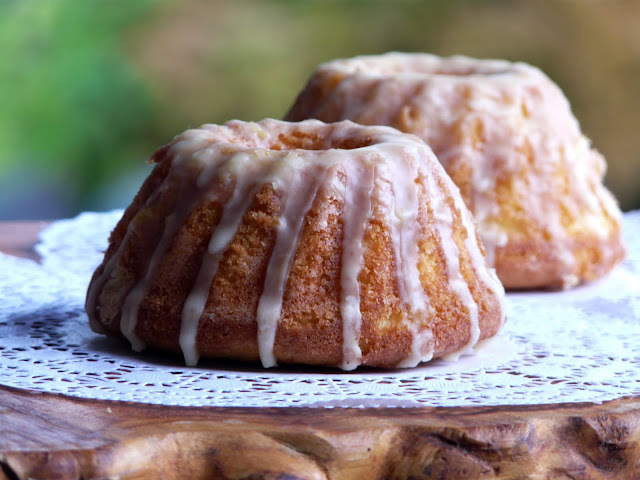 Your little orange bundt cakes are so pretty and perfect for my taste. I agree with you about adding a bit of vanilla. Terrific photos, Ann. Oh dear me. This is divine! Oh you made her proud I am certain!! I love it...AND...I like your photos...terrific! 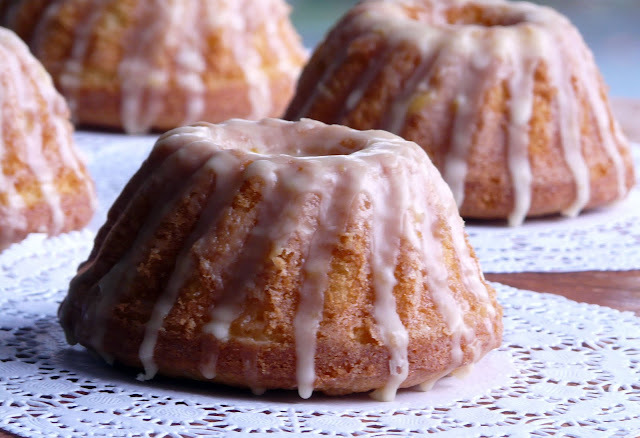 I need to get one of those mini bundt pans! I made these into cupcake versions last week and boy were they delicious! The cupcakes came out extremely soft and fluffy in texture. And I really liked the orange flavour. Kathy , this is the kind of recipe that is easy to convert. Just use 1 cup butter, one cup sugar, one cup flour, 1 1/4 teaspoon baking powder, pinch of salt, orange zest and 1/3 cup of fresh squeezed orange juice. I never measured the ingredients for the glaze. I just squeezed the juice from an orange and added enough powdered sugar to make a glaze. These are so pretty! Mmm I love the idea of their fresh orange taste...gorgeous! Those are beautiful, and the recipe sounds delicious! I've been craving citrus lately, and I love Jo's idea of making cupcakes. These Scilian orange cakes are just beautiful! I love it! Thank you so much! I bought some mini bunt pans and I'm going to fix this next week. Did you have to adjust the cook time by very much? Kathy, you will find a lot of uses for your mini bundt pans. Renee, the time does need to be adjusted. I don't remember how long these took to bake but it wasn't 45 minutes.